Update: President Trump Issues Biggest Threat Ever Over Illegal Alien Caravan! Another illegal alien caravan is traveling through Central America en route to the United States. Their goal? Enter the United States by any means necessary. They have all been coached. They know the loopholes. Everyone has a child in-tow, preventing the Trump administration from arresting any of them. Paul Ryan is laughing right now. He spent the entire summer blocking an immigration bill from reaching Trump's desk, and now thousands of migrants are on the march. Pres. Trump is putting pressure on Mexico to disband the caravan, but he needs your help to hold Congress' feet to the fire! Please, don't let the Democrats and Establishment Republicans leave the border wide open like this. You must send your instant message to Congress right now and DEMAND that they put a full border security bill onto Trump's desk by any means necessary, or else! Another illegal alien caravan is on the move in Central America. Their goal is to enter the United States by any means necessary. Their home countries aren't being consumed by war or natural disasters. These aren't bona fide asylum seekers. They are opportunists eager to game the system and take advantage of immigration loopholes that you refuse to fix. It is not a coincidence that every member of this caravan has a child in-tow. They know that you and your colleagues refused to close the catch and release loopholes. They know that US law and court rulings do not allow President Trump to detain whole family units. If they show up with children, they must be let go. They know that YOU kept these loopholes open. 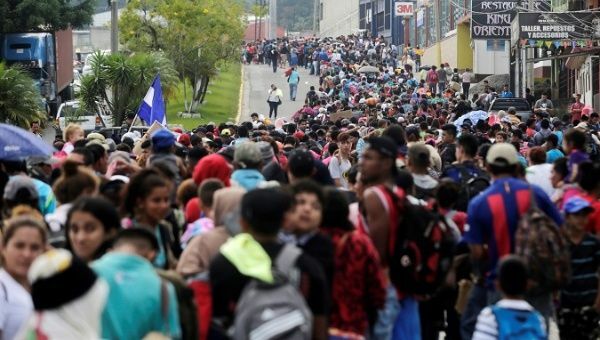 President Trump just issued the biggest threat he can: if Honduras and other Central American countries don't stop this caravan, they will lose all of their aid dollars. The response? The caravan was allowed to cross into Guatemala unchecked and has now more than doubled in size. You must take action. We are a generous country that has welcomed in oppressed and vulnerable people for centuries. But right now, our generosity is being abused. You know what is happening and you know what it will take to fix it. And yet, you do nothing. I am demanding that you close the catch and release loopholes. Give the President the power to enforce our immigration laws. I am writing to make sure it is absolutely clear that you won't be able to play the blame game any longer. Inaction is unacceptable. You have the power to secure the border right now, but it is your choice. Secure the border or else be removed!